A few comments which make easier to interpret the charts. - Savings: Accumulated more than $28 K USD for an investment ( which is 12.5% in the currency I receive my salary in, but it is slightly below the target in USD). I am under opinion that Ruble is underestimated, so it does not cause a lot of concern to me, at the moment. - Accommodation: As it tends to happen in Russia my building company is way behind it s big mouth promises and estimate time of new apartments handover is beginning of next year. - I sent a request to re-invest my shares dividends s into buying more of those. - Investment instrument is chosen and I became a bit more financially literate. Family budget. As promised I want to publish a break down of our family budget for August 2007- August 2008 and later on I will compare it with the one in August 2008 – August 2009. Accommodation – we have got no mortgage so we are renting a two-bedroom apartment. Bills – all bills related to maintaining apartments – electricity, heating, land line phone, internet, etc..
Kindergarten - we both work, so with child has to go to a kindergarten. Its actually enjoys it quite a lot, to socialize with friends and be among kinds same age. Car insurance – speak to itself. Miscell - gifts to relatives and friends, haircuts, cleaners and wax for our car, etc.. 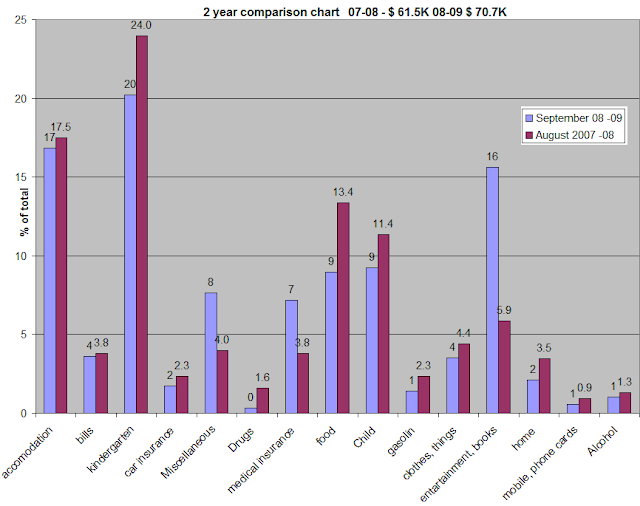 Drugs - primarily mouth healthcare products, occasional prescriptions. Medical insurance - speak to itself. It is provided be the employer, so we have only pay 200 a months, for a family coverage, dental is not included. Food – We separated our food from the child, as its primarily consumes organic only. We thought it would be a good start to build a strong foundation. Child – everything related to it – food, clothes, toys..
Gasolin – idea was to look how much to we spend on gasoline and how it weight in overall budget. I know that gas price affects other items as well, but we just thought it would be nice to count it separately. Clothes, things - speak to itself. Entertainment, Books – occasional days away and vacations, it is also include all other expenditures – cinema, restaurants, parks, etc..
Home - everything we need to buy to maintain our living in it. Mobile, phone cards - speak to itself. Alcohol – it is good to count, what we are spending on it. Apart from special occasions we tend to limit ourselves to $20 per bottle of wine max. We quite a like in our leaning towards wine, rather than spirits and beer. We do not keep any special finance programme, just an Excel spread sheet. It takes a bit of discipline to fill it after each purchase or at the end of the month, working with statement, but it worth it. First day of last summer month 2008. The beginning. I have to admit that over last year (2008) my small family spent about US $80 K, hadn’t spent on a single purchase more than 600 USD. We do not owe a house, some there is no mortgage, no credit card debts. Thinking about it I realize that our expenditure risen dramatically and I am uncertain whether I manage to maintain such income in years to come. I decided to set a goal: to achieve financial independence from my current job by 2019, i.e. to have an annual income at least US $60 K in money at 1st January 2009 for next 40 years (until 2059) from my investments and be able to send some of the income for re-investment to overcome inflation . It does not mean that I am going to quit working in 2019, as I believe that life is work, but wish to achieve financial independence from an employer. Doing our in-house budgeting/accounting we decided to fix our expenditure at 2008 level despite inflation of 5%, as believe that we can spend our money in more rational way. As the budget contains a lot of sensitive information I do not plan to make it public, however overall allocation of expenditures will be presented at some stage. Ex-Russian citizens migrated somewhere overseas did not manage to become part of the culture they are working in and achieve desired level of income beating about the bush of financial matters, not being specific and not setting an example. Pseudo-investors putting a lot of general information and motivational posts about financially successful people in Russia and abroad, stories about stock market and trying to generate number of visitors so the owners could benefit from advertising on the websites and selling books via partners programs. Stock operators (speculators) posting a lot of very specific information about stock markets, which is hard to understand by a novice investor and really meaningless to great extend as they talking about daily speculations, as most of the people do not have time nor knowledge to track the markets every minute. Most of such blogs have got very strict moderation where by doing so being created image of happy community adoring its author, all critical or questionable info is erased. With my today knowledge and time available to me I do not want to speculate on stock market daily/monthly. This year all investments are going to be made in mutual funds only, not individual stocks, in a hope to achieve return over long period of time of rate of inflation +7%. I have a sum of annual expenditures, which will deposited on savings account with yield 3.5 % and serve as buffer, just in case I need money unexpectedly over course of next 10 years. I will subtract a fix sum from my monthly income (US $5 K) and put on wife’s account. If we will manage better our budget the difference will go to her personal investment account, which I am going to discuss briefly here but only in way of choosing the instrument of investments, the money won’t be counted towards my goal. My contribution to family budget : US $5 K USD monthly, US $8 K – annual vacations, US $5 K towards presents and unforeseen expenditures. Overall: US $73 K a year, after taxes. Working on self development and seeking additional sources of income for investments in my financial independence. It is what I am going to discuss here : analyzing investments opportunities and results with real money , my money. In addition I will find resources to secure a web site for my blog and the web design, than it will become live. I have got a small number of shares which I was presented with back in 2005, I submitted a re-investment form, so all dividends to be re-invested in new shares. Expected growth – 5% annually. Thank you for reading this blog. Financial decisions are of a paramount importance. When it comes to building personal fortress it is a long term goal. Long term is series of short terms. This is what I want to put here: my financial journey - one step at a time. 1. This website does not provide any financial advice or guidance. Your position is unique and different and you have to seek a professional guidance before taking any actions. 2. I am not promoting or suggesting anything. I will merely describe my thoughts and ideas. Reading this web site does not establish client -advisor relationships of any kind. In no case can I guarantee the performance of every product and service I discuss, and I am not liable for any of your loss from trying these products or services. 3. I am not endorsing anything in adverts appear on this web site. This web site relies on income from the ads appearing here, use your own judgment and seek professional advice prior taking any actions. 4. I will make efforts to prevent any possible infringement of copyright of the authors and publishers regarding the materials presented on this website. However, should any person or legal entity believe that they have rights in this matter, they are requested to contact me..
5. All rights reserved under International and Pan-American Copyright Conventions. Unauthorized reproduction and publication in whatever way or form, either mechanical, electronic, by copy, recorded or in any other way, without written permission by the publisher and the owner of the rights is prohibited. What is a financial independence ? Intention of this blog is to share experiences and gather ideas on a road for financial independence. At the moment this means to have sustainable income from my investments to maintain current life style. This means US$ 60k in 2010. At the moment my net worth is US$ 119 K. I will use 3% interest as basis for my calculation, meaning that I need to have $ 2, 000, 000. I started accumulating some materials about my personal finances about year ago and will post them within next month or so. 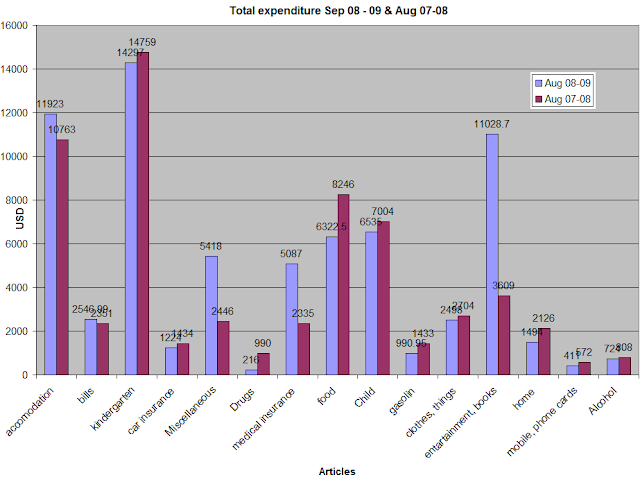 This would be spending habits and some analysis on how we spent money. My intention is to update this on a monthly basis to work out routine and keep track on the progress.